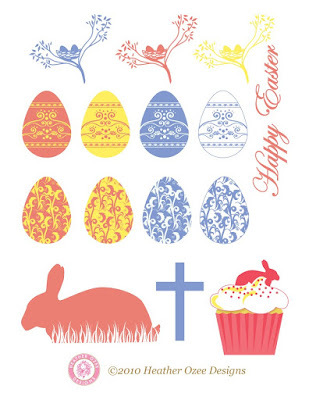 I just wanted to take a second to tell you all Happy Easter! Take a moment in all the craziness that surrounds holidays with family to remember the sacrifice that gave us this holiday. A real trend these days is doing a little more custom invitation that features a fun character of the mom to be. So with that in mind check out these new invitations available at my store. Spring is here and that means showers! 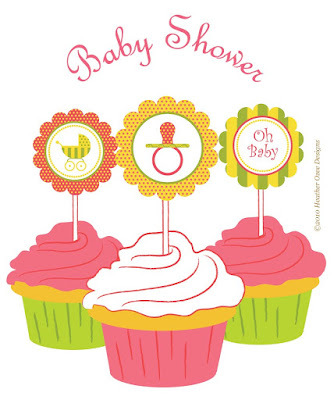 Spring Showers, Baby Showers, Bridal Showers, Oh My! 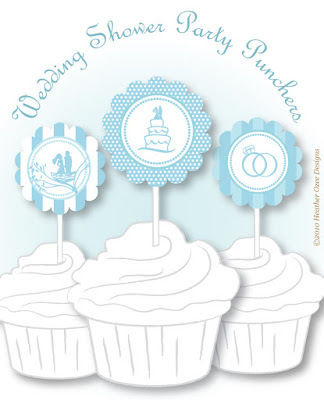 Don't forget to stop by my shop and check out what we have to offer for your next celebration. One of the best ways to make an occasion memorable is by having a theme customized to the theme. For instance say my daughter Hilary was graduating from high school. Well of course she and her friends would love a grad party that had little cap and gown type decor on her cake or cupcakes. 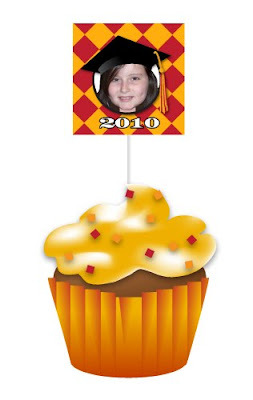 But imagine the response from party goers when they saw cupcake toppers that featured the guest of honor's head with a graduation cap and school colors! Friends it really is the simple things that make them talk about your party for years to come. 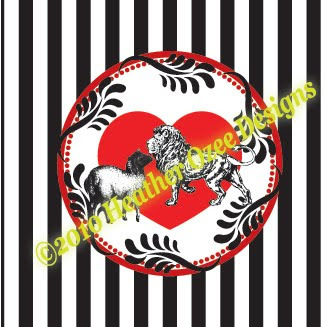 As a designer and illustrator I know that my abilities to create come from a gift that my maker blessed me with. I know that when a difficult project comes along Prayer really does lead to amazing ideas. And on this note I'd like to share No More Mondays by Dan Miller, a book full of inspiration and guidance for those wanting a change or who's been laid off and needs a new direction. Change can be simply wanting to move up the food chain at your office... or it can be a total "pack up the kids we're moving to the islands to teach snorkeling" kind of change. Dan was raised Mennonite and teaches that we all have God given talents and passions. As it states on Dan's website, he believes that a clear sense of direction can help us become all that God designed us to be. Check his book out and start changing you life one day at a time! 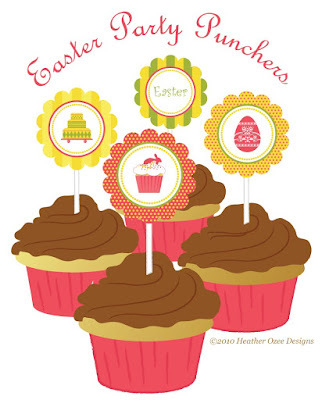 Easter is in the air friends! 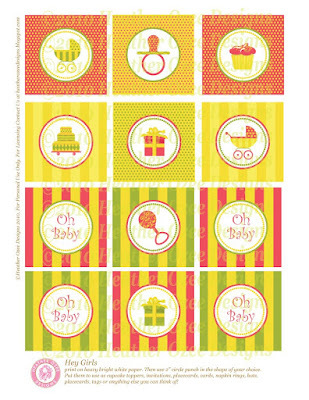 Check out the fun favors I've been busy whipping up. 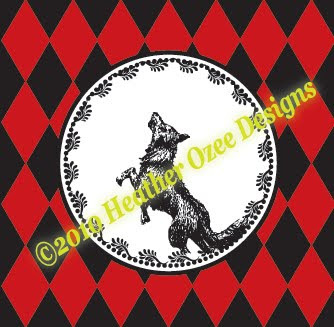 All these designs and more are available at my etsy shop. 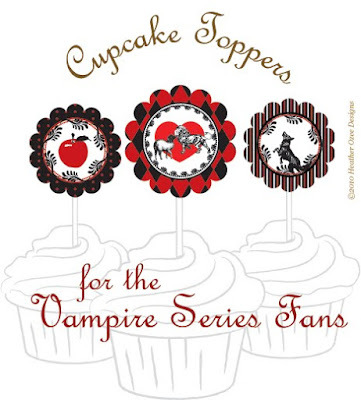 In honor of the release of the Eclipse trailer I'm re-posting images of my Twilight Themed cupcake toppers and cards. You can purchase them at my etsy store! I could see Bell and Edward sharing a cup cake with one of these on it! Couldn't you? 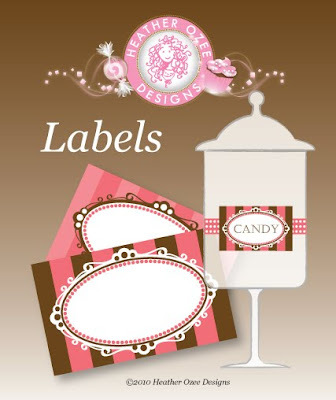 I'm busy creating a fun series of labels to put a bit of ooh la la to our ordinary kitchen canisters. Stay tuned for updates. 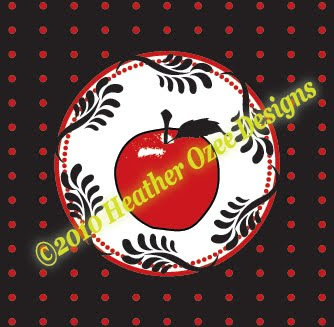 For now here's a sample of the party themed labels I have at my etsy shop. 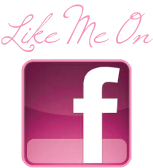 I was just thinking about the website I designed for Ashley Vicos. You may recognize the name. She's the amazingly talented Cake Artist who has appeared on The Food Networks Cake Challenge and on TLC's Cake Off. It was a blast working with her. I loved her Cake Challenge Shrek cake. It featured Donkey sitting atop a crate with Shrek's hand reaching out of the crate. Bonus, not only is she unbelievably talented... She's also just as nice too! Checkout Ashley's website. 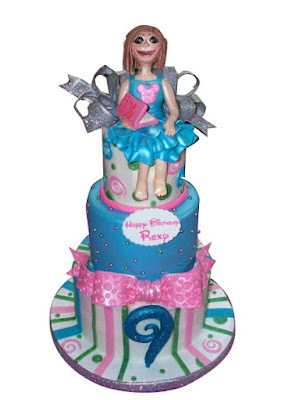 So, were very proud to serve a Sweet Ashley cake at my daughter's 9th birthday this year. It was not only beautiful, but tasted divine! Roxy loved it. So you just found out that your best friends is having a baby. 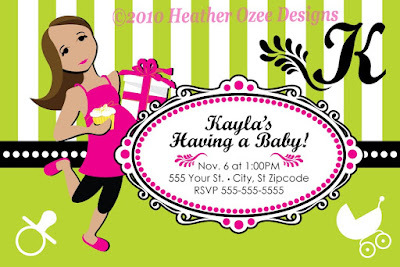 Throw her a Baby Shower that all her guest will envy! 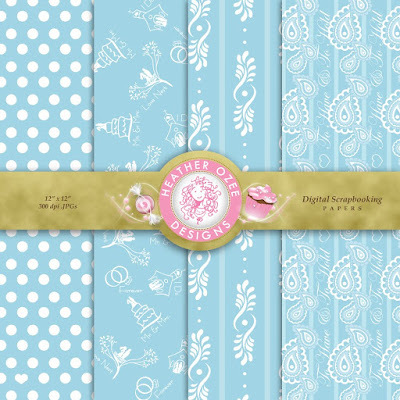 Make it fun and enjoyable for all the guest whether they are the mom to be, the grandma to be ... or the friend of a friend who tagged along. Don't forget to keep it gender friendly, many dad's and husbands join in on the fun these days. Luncheon's are Always a Hit! Make it stuff they actually want to eat! Wings are a great appetizer to add along side of the finger sandwiches. I always like to have a salad that's not only yummy but beautiful too! Make it colorful, toss some strawberries, blue berries, pecans and feta in and with a fancy pants vinaigrette and they'll ooh and ah the rest of the day. My friend April is the queen of the Slap Your Mama it's So Good Salad! Don't forget to have have at least two good desert choices, one being the shower cake. I won't go into what recipe to use because we all have a tried and true family recipe for punch. And if you don't the web is a bountiful resource. But, we must talk about having Punch. Maybe it's the Southern Bell in me or maybe I'm just old fashioned. What ever the case maybe, it's not a shower if it doesn't have punch! My aunt has always served punch in a new baby bathtub with a little rubber duck floating in it. It's a Never Fail Hit I promise! On the other hand some of us are lucky enough to have sentimental family punch bowls that look divine when filled with punch and a few pieces of floating fresh fruit. I always like to have a carafe of Fresh coffee in a well appointed spot. Splurge on nice flavored creamer as well as half and half. And offer a sugar substitute along side the sugar. 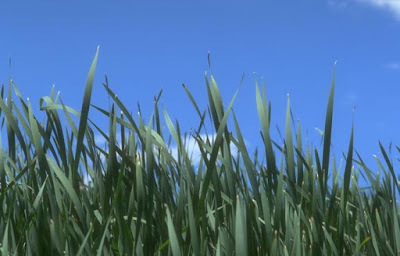 This can be a lovely site when done with a little panache. Offering water bottles that you wrapped with a fun label tying into the shower decor is a lovely way to refresh guest too! 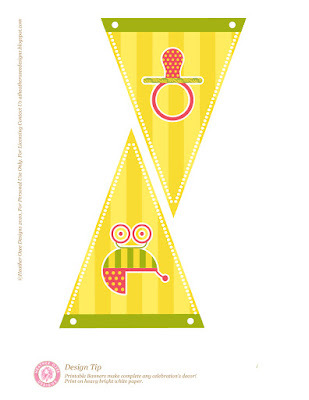 When I mention baby shower games a lot of people roll their eyes. What's behind that? I think we all have been at one of those showers that left us holding mirrors under the noses of guest to the right of us. Has she been bored to Death? Call EMS! Games can be a the best part of the shower, Really! Gross them out and have them rolling in the floor! I actually saw it on TV at a celebrity shower and I've been using this one ever since. You simply melt candy bars one by one in the microwave. Place each candy bar in a separate diaper. We're going for texture, color and variety, so don't get six Hershey Bars and call it done. That will be a flop. I also put a little pickle juice in one diaper and usually hit one diaper with a little mustard. Us moms and Dad out there can all remember having a new baby and a sudden aversion to mustard for at least a small amount of time. The game goes like this: Pass out note pads and pens. Then start passing around the diapers for party goers to smell and even taste the diapers contents. Have them write down what they think each diaper contains. Make sure all diapers contents are edible. Whoever gets the most correct gets a prize. It could be a Movie Rental Gift Card. Let's face it, pregnant women seeing people pull large lengths of toilet par to guess her width is hilarious. And I've had it done to me, and no I didn't require counseling afterwords! With these 3 areas covered all else will fall into place and you and your party will be a star! There's nothing more fun than getting together to celebrate an upcoming wedding! 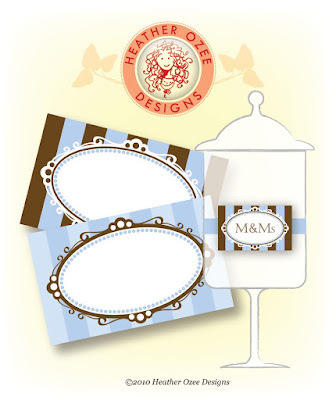 Check out this Bride Pleasing Wedding Shower Set. I also offer custom maps designed for that special day that are illustrated with the same style as you see below. Friends, I can't resist sharing a funny story with you about my youngest daughter. 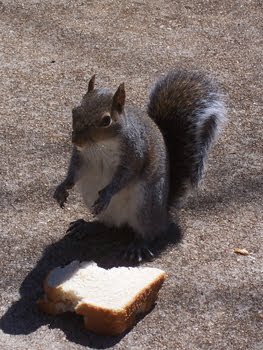 Today she ran into the house and said, "Mommy the squirrel took my sandwich!" Now I have to admit I thought this was her playing with me... but I stepped out the door and what did my eyes see? A squirrel eating a peanut butter sandwich! She explained that she was sitting on her blanky eating her sandwich and playing Barbies. She ran in to get another Barbie and when she returned BAM, The little thief had struck! So I grabbed my camera and snapped a few picture to share with my friends. Have a Great Night and don't stay up too late! Can't miss church in the morning girls! Fairies and Angels Oh My! My studio has been taken over by cute little winged creatures! 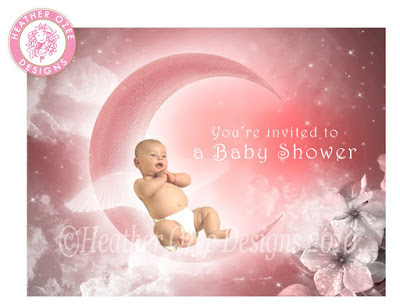 Well, not really, but I'm excited to share my Printable Fairy & Angel Invitations with all you out there in Blogland. 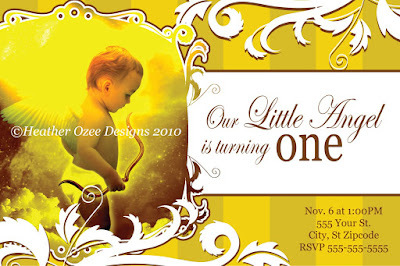 The customized invitation file will also come with a Bonus 5" x 7" Fairy Portrait derived from the invitation. These files are ready to print either from home, online printing services or your local copy shop! The purchase is only for personal use and not for commercial use. 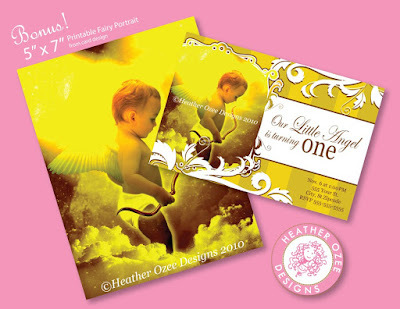 For more details about purchasing this fun printable invitation and portrait go to Custom Fairy Invitation. 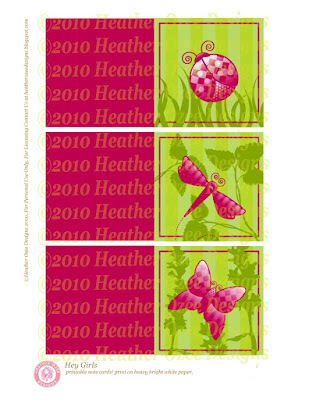 My spring 2010 Garden Party Collection is also available now. I love drawing things we find in nature. And the girly girl in me has fun adding a splash of pink to little creatures that are already so amazing. I've posted the note cards and will be adding more in the days to come.